About External Memory SD, Course PC repair. 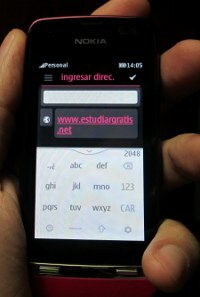 => Esta lectura en español (This reading in Spanish): Uso de Memorias SD; celulares y cámaras en la PC. About the use of SD Memory, cell phones and cameras in the PC. Now that I started to talk about the issue of memoirs and Repair, let's advance a little more on the same line, so at least you know details that will be useful. And, as is now widely used cell phones, I will comment something about them. 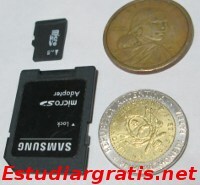 Examples of memories used as storage medium in small devices are: SD, Micro SD, SDC, SD Ultra, etc.. These are flat and slightly larger than a coin but from a square or rectangular shape, and with capacities from 1 GB to 36 GB and more too. The Micro SD are the most common. They are typically used in digital cameras, MP3, MP4, mobile phones and other devices including some Netbooks. To change to more capacity simply is changing to another, and the contents you must "copy" and "paste" in the new memory from a PC, including hidden files. Are marketed different types of readers for these memories, so that it can be connected to any USB computer. When the device is connected into a PC that it contains, this is generally identified as a Removable Storage -pay attention in Microsoft Windows before Seven amount of units and partitions, can give errors without catching it and ask formatting it if necessary. Then it's easy to share files between the computer and the connected device, from the System File Explorer that you have on the PC. But keep in mind, the program called "driver" it should be fully compatible and well connected and installed, if necessary, or in other words a software associated with the device; program intermediary between this one and the operating system of the computer, usually a PC automatically it detected without need it, unless it's an old computer. Do you sometimes detect it, others don't? Try cleaning the contacts, for example using WD-40. Probably the customer needs a repairer of PC that teach him and installs the necessary to use a digital camera connected to a PC -it's usual connected it by USB port, available in almost every computer currently-, or even a cell for send things into computer. It connects via USB port, and is installed the programs that include the CD, through "copy" and "paste" from the file browser, contents are passed. In cells, the contents are placed in the corresponding folder in each case to be well taken by the respective programs. Before, in relation to the cells, could be used in some cases a special cable that contained hardware, plus some program and determined settings, for example from the communications port COM. Now, usually the PC detect them correctly, become commons the USB connections, even displays the cell like connected, like if be an external storage system. Some companies offer an additional software to make backups of phone and others. It tend to be easy to use. There are many contents in estudiargratis.net that are continuously improved. Under the battery of cell phone is where usually is included the Micro SD Storage Memory, but some models in some slot with some type of cover or not, with the memory that sticks or loose like if is a button, for its easy exchange. Customers, can ask for a technician to show you how to download to PC the photos from camera, or media from mobil... So, in general is like I said: it connects with a USB type (provided by the team question), and the cell is detected as Removable storage unit on the computer. If the computer asks for a driver, you must to install it, -should have it the user or have come with your camera or phone, otherwise, search the Internet first in the manufacturer's website-. Although it seem strange, these things also is usual to ask for it to a PC repair technician, at least when home repairs are done, not from enterprises, for that reason is even tried this theme in the course of repairing computers. On Linux-based systems usually operate equally everything well in modern systems; but sometimes errors may arise such as in example: a Windows detects it well, and not in a Linux distribution (and there are many versions of Linux ...). Just in case I clarify, are different Operating Systems. I came up with a Kodak camera, excellent camera; but in Ubuntu, on a specific computer, occasionally only showed the first pictures, and the rest didn't; but into another computer all are looked.